41 Cooper Square, designed by Pritzker Prize-winning architect Thom Mayne and his firm Morphosis, is a new academic facility for The Cooper Union for the Advancement of Science and Art. 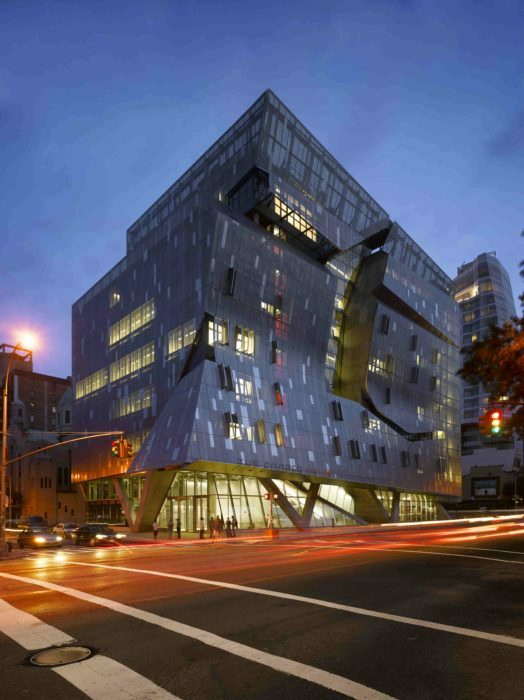 Located in Manhattan’s East Village, it houses the Albert Nerken School of Engineering, the Faculty of Humanities and Social Sciences, the Louis and Jeannette Brooks Computer Center, The Herb Lubalin Study Center and The Saturday Outreach Program. 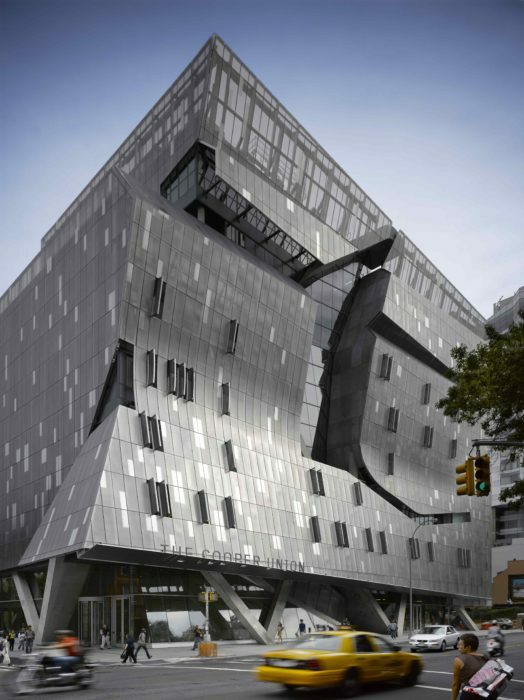 The new nine-story facility was New York City’s first “green” academic laboratory facility, awarded the LEED Platinum rating. The new 175,000 square foot building includes environmentally sensitive and technologically sophisticated laboratories, studios and classrooms, in addition to student and public spaces. 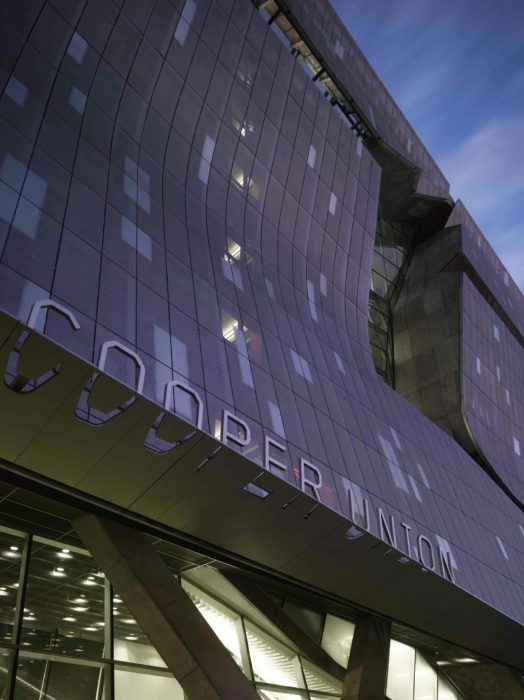 The building features perforated, stainless steel skin with operable panels. The true wall of windows can be seen behind the skin. 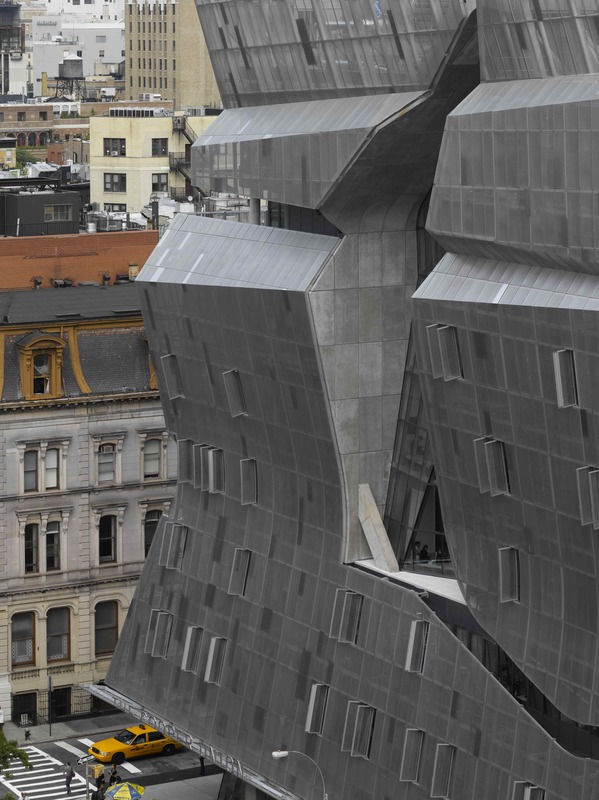 A cut-out through the Third Avenue facade creates a dramatic feature from the street, and hints at the internal atrium that the architects describe as a “vertical piazza”. This screen reduces the influx of heat radiation during the summer and serves as a wind breaking surface in the winter. The innovative wall system improves the building’s performance through control of daylight and selective natural ventilation. The screen is built of smaller panels which are operable and can be controlled by the inhabitants of the classrooms and studio spaces behind them. Wallace Engineering provided structural engineering services for the screen wall system and the required backup framing for the building, including analysis of the thin perforated panels for diaphragm stresses in high wind conditions.